I have definitely been feeling pregnant this week. It's starting to get a little uncomfortable now. I have really struggled with the school runs and coping with the girls. Some days they have been good and others they have been a nightmare not listening. It's a bit tough at the moment with Elliw but we're taking it day by day! Her temper can be a little too much though. Other than that, I do feel ok with myself. Pretty tired but that's nothing new. I had my midwife appointment for my GTT test and normal weekly bloods for OC on Wednesday. I think my results for GTT test are fine because she didn't call me the next day. I got to hear baby's heartbeat and my friend got to hear it too! I was away last Wednesday so was unable to take bloods. I got my results for my bile acids and ALT from 2 weeks ago and they have raised again. My ALT was 53 but now it is 60. My bile acids were 10 but now they are 13. So with me not having my blood test last week, it will be interesting to see what the results are next Wednesday. I do hope they stay below 14. If they are 14 or above I will be referred to hospital sooner than planned. My itching is still there but still mild. I have felt it a bit more the past few evenings. With my girls it started on and before 30 weeks so I am just trying to enoy these last 5 weeks before hell starts (if it does!). The girls are still excited to meet their baby brother. I still have them both (Mia mostly) coming up to me and giving bump a kiss and cuddle. They still ask questions and interested, which is great. Mia comments a lot about my weight such as my hips are getting fat, wondering if I will be thin after Baby boy is born and so on. Things kids come out with is hilarious. Baby boy is moving a lot this week. I can't sit properly, I have to sit a certain way to be comfortable. I can really feel him pushing up at the top of my bump and pushing straight down too. If I am honest, he feels huge already! His kicks and movements are getting stronger. I have been extremely tired, stressed and emotional. Some days I just want to be alone in peace. No chance of that with kids though. Other symptoms have been sore breasts, some shoulder pains and growing pains! I feel so lazy. 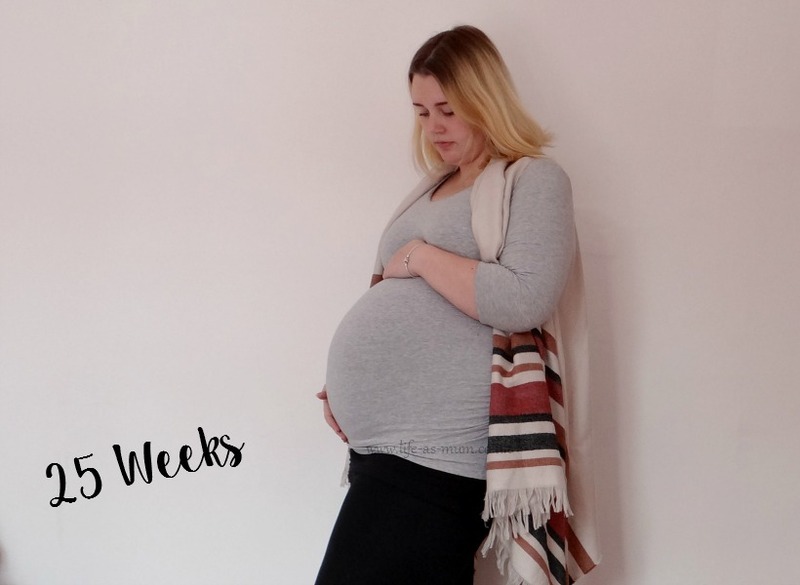 You've written about 3 updates since my last pregnancy update of 22 weeks. I need to get my ball game going. Hi Beth, looking after a young family and being pregnant can't be fun (I've blocked the whole experience from my memory and ever had one child to look after whilst pregnant). Hopefully Elliw will calm down once she realizes she's a big sister? It's not nice not being able to sit comfortably, so fingers crossed baby boy shifts into a better position for you! Sorry to hear about your tough week. Over half way now though. I hope everything settles down a bit for you over the next few weeks. You do look wonderful indeed. You have such a glow about you - pregnancy obviously suits you! I hope you have a better week ahead. It's the final bend now - nearly there! Remember to take time to relax! Look at that beautiful baby bump! Nice update! The next trimester will fly by! Another lovely catch up in your pregnancy journey. I keep my fingers crossed that your results are good, and you don't have to go into hospital! Love how the girls give the bump a kiss and a cuddle! Good luck for the last bit and hats off to you managing two kids, a pregnancy, a blog and a life! Clap clap! Sorry you have had a tough week, hopefully the next few weeks will be a little easier for you. Oh I feel for you! It's been over 4 years since I was preggers but I remember it well. I was NEVER comfortable after about 25 weeks. Love that the girls kiss your belly and I'm sure are excited to meet new little brother. Thanks so much for hostessing #justanotherlinky. Your'e not alone when it comes to having peace and quiet. I quickly came to realise how I like to have some alone time when my daughter was born.